About the Book: Rio lives Below in Atlantia. Since the Divide, Below in Atlantia is the safest place to be. The intricate water system of tunnels and habitats makes a safe environment for the surviving humans. But Rio longs to go Above. After the death of their mother, Rio promises her twin sister Bay she will stay Below and they can be together. But when Bay unexpectedly chooses to leave for Above, Rio is left to figure out just why Bay left. With a dangerous mentor in her aunt, Rio tries to uncover what happened to her mother and tries to formulate a plan to escape through the complex system of Atlantia to Above. 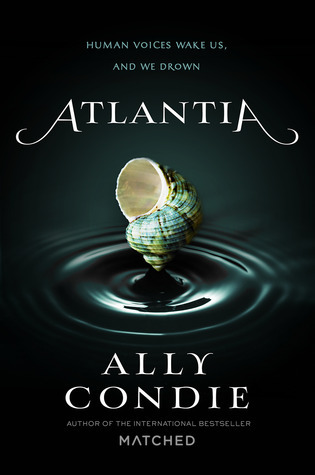 GreenBeanTeenQueen Says: It's hard to describe Atlantia. It's a little bit dystopian, an underwater world setting, a story about sirens, and a little bit of mystery. It's a book that has a lot going on! The main part of the story focuses on Rio, who is trying to find a way out of Atlantia and escape to Above where she longs to be. Things are unveiled slowly throughout about Rio's gift as a siren and as to how and why the Divide occurred and how Atlantia was formed. If you're a reader who wants all the information up front, you're going to have to be patient because things are uncovered bit by bit. Hints are dropped throughout and things mentioned and then layers are added to the story to slowly answer the questions Rio and the reader have. Rio is a siren, as is her aunt and sirens are one of the miracles of Atlantia. I really liked the siren lore and aspects of the novel and it was unique without feeling like a paranormal. I think even readers who typically shy away from novels with magical creatures would find these sirens to be engaging and very human. The plot is interesting and the story is engaging, but it does have a bit of a slower pace, which might surprise some readers, especially fans of Matched. The writing is rich and detailed though and Atlantia is an interesting world to uncover. The great thing about Atlantia is that it's a stand alone novel-yay! Don't worry about having to commit to a series-it's all right here in one book. Would you like to win a copy of Atlantia? One lucky reader will receive a signed copy thanks to Penguin Books for Young Readers! Leave a comment below to enter. hooray for more ally condie! A stand alone novel, yah indeed! :) This sounds very interesting, but please don't enter me in the drawing as I have a lot of books to finish reading at the moment. I am excited for another standalone! My daughter would enjoy this book. Plus it being a stand alone has its bonuses. Not a lot of time for series right now. This sounds great! I love stand alones and a book about the ocean and an underwater city yes please! I know my daughter would love to read Atlantia. when will you annonce the giveaway? The winner has been notified. Thanks for entering.